There have been countless films that deal with artificial intelligence. “Ex Machina” is yet another one. And yet in a time where not many films truly feel original, “Ex Machina” manages the difficult task of showing us something we haven't seen before while not forgetting all that came before. The difference is that the film is a superbly crafted little thriller. It's focus is more on characters than it's effects, which actually works to its benefit because what little effects there is are simply amazing. And of course, like most films in this genre, the less said about the plot the better. When Stanley Kubrick died back in 1999 he had started planning on directing “A.I. Artificial Intelligence” which was eventually directed by Steven Spielberg. What resulted was somewhat of a beautiful mess. A film with conflicting outlooks and a sort of uneven story. I truly feel “Ex Machina” is what Kubrick might have made had he lived long enough to tell a story about artificial intelligence. We're introduced to computer programmer Caleb (Domhnall Gleeson) who is whisked away to meet his genius boss who lives isolated in a large sterile high-tech research facility, seemingly alone. He's taken via helicopter. There's he finally meets Nathan (Oscar Isaac) who is as brilliant as he is an alcoholic. Nathan tells Caleb that he's created an AI that is seemingly human and wants him to take part in research tests with it. Ava (Alicia Vikander) is a magnificent creation who moves, looks, and acts like a real human woman. Only the metal pieces and wires running through her arms, lets, and torso give her away as a robot. Ava is not only a magnificent creation but she's a technical wonder cinematically speaking. The special effects that bring this character to life are nothing short of amazing. It's truly a technological breakthrough as Ava is a stunning visual effect. The film then presents us with segments in which Caleb and Ava interact – with Nathan, somewhat creepily, observing via cameras. Writer and director Alex Garland, making his directorial debut (and frequently collaborating with Danny Boyle), has crafted his film much like a play: there really are only a few characters and most scenes consist of conversations between Caleb and Ava and then between Caleb and Nathan. As the sessions go on Ava appears to have a connection with Caleb and the audience doesn't quite know where the film is headed, but the film has an overall sense of doom and gloom: something bad is definitely coming. Nathan is an interesting character – he's obviously intelligent but has serious flaws which are easily exploited by Caleb who suspects there's something Nathan isn't sharing with him. To say anymore would do a disservice to the viewer. 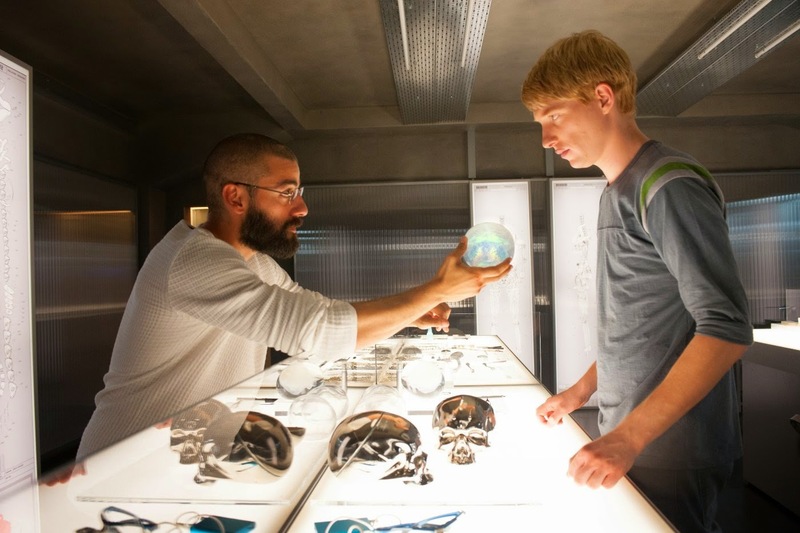 Theatrical Trailer for Ex Machina on TrailerAddict.